Basfords are your bifolding door experts. We’ve helped many customers improve and add value to their homes with our quality and expertly installed bifolding doors. Our experience in folding doors means we have a lot of knowledge and advice. This is how we help our many customers make an informed buying decision. The the aluminium bifolding door being so desirable a byproduct of this success is wide choice. How can you be sure what’s the right door for you and how can you find it from the right company? le installer? All bifolding doors are not the same. A typical bifolding door comprises many parts and components. All of these work together to ensure your doors slide and fold as well as remaining weathertight and secure when closed. With so many doors installed at the back of the property security is very important. Study a quality bifold in detail and you’ll see a combination or rollers, tracks, running gear, guides, locks, handles and hinges. All of this hardware must be well designed. It must not only take the weight of what are heavy doors but also help them slide and fold with minimal effort. If you consider that your typical folding door is far larger than any hinged door, so it becomes important that doors are well made, well engineered and ultimately reliable. 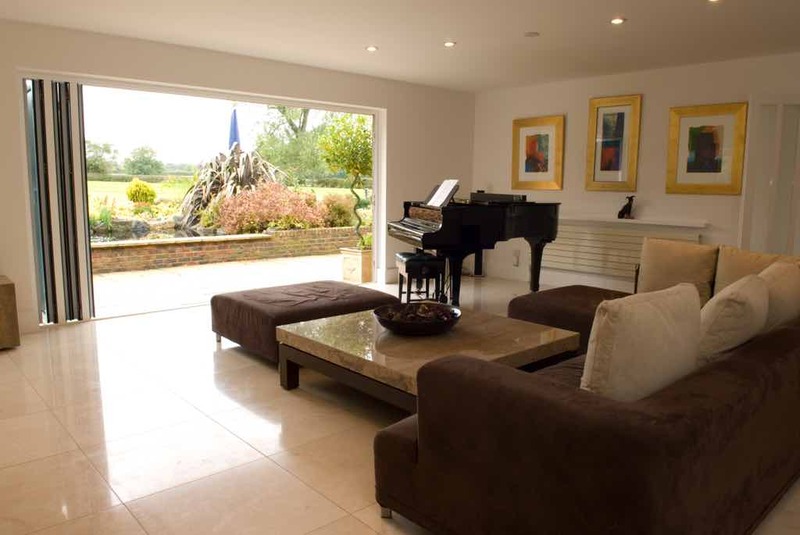 Our Origin bifolding doors are a great example of British design and engineering at its very best. They’ re the only doors on the market with a 20 year guarantee. This is not to say all other doors are inferior, merely that our Origin doors are so well made, designed and installed that you deserve this exceptional guarantee and peace of mind. Our bifolding doors bring you the best in security, performance and thermal efficiency. As we mention, folding doors are often fitted to the back of the property. It’s well known that the rear of the property is often targeted in the event of a break in. So whether your property is out in the country or in a city it’s important to consider security. With so many door leaves all connected together bifolding doors must not only be weathertight but also very secure. Our aluminium bifold is exceptionally strong as a material despite being so slim. Inside you’ll find only the finest quality locks. Origin doors feature an 8 point locking system tested to Secured by Design. Schuco doors are also exceptionally secure meeting WK3 and WK2 security testing. The construction of our doors means joints are secured in the most rigid way possible with heavy cleats, fixings and exceptional sealing. This is what prevents doors coming apart in the future. The door handles are of premium quality. If you visit our showroom and try out the heavy sprung handles on our doors, the quality of them is evident from the outset. Many other types of doors on the market use industry standard hardware, much of which is designed to fit all sorts of doors. Ours are designed exclusively for our products. An expert installation is critical. Many people choose to DIY install their doors and then find that they’re not working correctly. With a bifolding door installation there are several key things to remember. The first is that the structural opening is far larger than conventional door openings. Some doors span up to six meters or more. So not only does the opening have to be plumb and square but so do the doors across the entire width and height. Glass needs to be suitably ‘heeled and toed’, door leaves need precision adjustment. The door threshold is vital to such a wide door and needs to be properly packed, bedded and fixed. The same applies to the outer frame on the head and the sides. Therefore an expert installation is absolutely essential to ensure your doors are reliable and stay reliable. With so many bifolding door installations under our belt, at Basfords we know our bifolding doors. These doors offer a completely different user experience to other types of doors and the purchase of bifolds is not only an important one but a major investment in the home. We’ve carried out a lot of work for people renovating their homes to sell. Feedback tells us that often a bifolding door whether stand alone, or in combination with an orangery or lantern roof is often what sells the house! We’ve invested heavily in our showroom to bring you the best buying experience in an environment where you can see lots of doors on display and ask questions. Only by seeing a bifolding door in the flesh can you try the doors, see how they operate and above all where you like the look of them too. Visit our showroom and you will see a large range of folding doors in a choice of colours and styles. Our Origin doors are are hugely popular product. We’ve worked hard to become an approved installer of Origin doors and it’s by far our most popular product with our customers. This is why we are the winner of the Origin Trade Awards for Best Trade Partner for the Midlands region. The exceptional Origin bifolding door possesses a host of innovative features that make them stand out from many other doors on the market. But don’t just take our word for it. You can find out more about what makes Origin bifolding doors so exceptional. If you’d like to view these and a host of other advanced, secure and energy efficient products, contact us, visit our showroom or call us on 0115 895 4948.